WHAT ARE THE BEST HIKING TRAILS? What Are the Best Sapa Hiking Trails? The purpose of almost travelers to Sapa is that they grace spectacular mountain views to colorful hill-tribe markets in this highland town in northern Vietnam. Spend several days there if you can, and be sure to check out the strolls, treks and scenic drives listed below. Mountainous areas of northern Vietnam is among the best places all over the country for hiking. 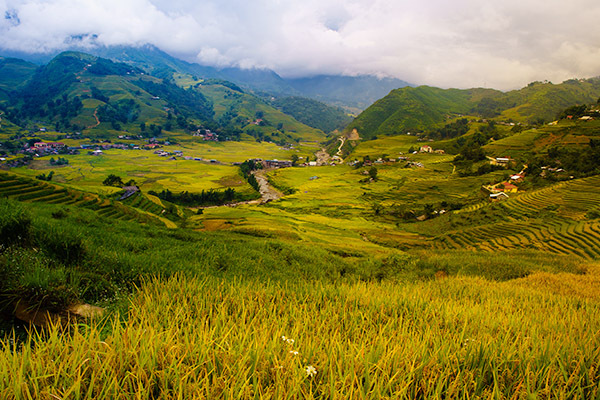 Depending on their hiking skills and ability, tourists can choose the hiking route which is most suitable, as Travel Sense Asia offers the best Sapa hiking trails for tourists. It may be said that this village need to stroll than hike, this trip provides an excellent overview to the countryside surrounding Sapa. Cat Cat village is an ideal trekking route for someone who want to gain more challenging as you should hike Ham Rong Mount route but still acceptable for all tourists. This is an old village of Black H’mong people where you can discover many interesting facts about their ordinary life as well as culture and architecture. Cat Cat village is also the perfect place to see traditional clothing being made, hemp being dyed and women weaving colorful. In Shin Chai village, local people will spend the time to teach textile weaving and dying and they take the group on a locally built trail. Coming to Sin Chai you will have chance to take pleasure flowers as peach blossom, plum blossom, gladiolus, pear blossom, rose, chrysanthemum. Continuously, A suspension bridge will lead you uphill to Y Linh Ho village, which is a small commune composed by many small hamlets scattering on the very tough mountain terrain with high and steep mountains. The Black H’mong lives in this village. They wear the dark clothing and navy dyed with indigo which often seen in the hands of older H’mong women. Their houses are built on their farmland and on the mainly cultivate corn, dry rice on the steep hillsides. As a result, the only way to get to the village is on foot on the road. From Sapa, you are easy to hike Ta Phin Village for around the tribal village. Several hill-tribe villages lie in Ta Phin, you need 30 minutes to get there from Sapa town. Black Hmong and Red Dzao live in neighboring villages. 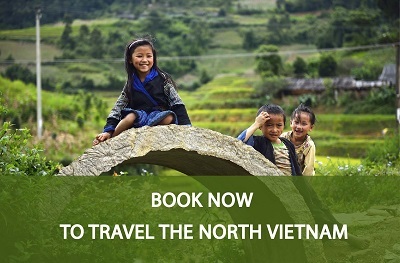 Luminous green rice paddy and traditional villages set in a highland valley ringed by mountain peaks. Variable, as you could easily spend a whole day here. Most people take about 2 to 4 hours total. It is easy to moderate in spots, especially in the caves. You can ask before taking photos, as the Red Dzao are particularly camera shy. This mountain valley has an idyllic feel to it, but keep in mind that tending those rice paddies is backbreaking work barely sufficient to feed local families. 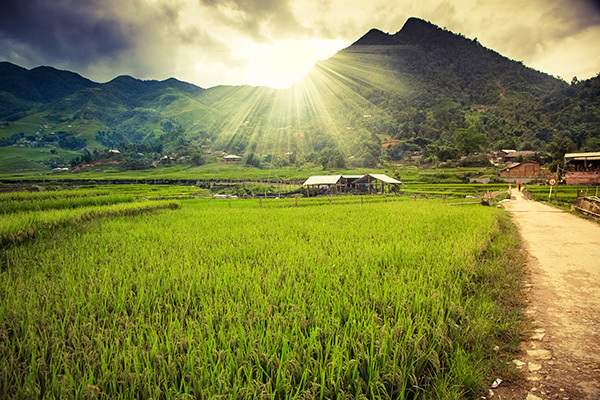 Also, while Ta Phin is a great way to get outside Sapa, it is quite easy to discover. Expect to spot some of the same foreign faces you have been seeing in the cafes and restaurants of Sapa. After hiking past beautiful terraced rice fields, you will cross a gorgeous bamboo forest which belongs to Hoang Lien National Park to a picturesque waterfall in Giang Ta Chai village. Giang Ta Chai located in the opposite to Muong Hoa stream and was hidden by old trees and bamboo groves. 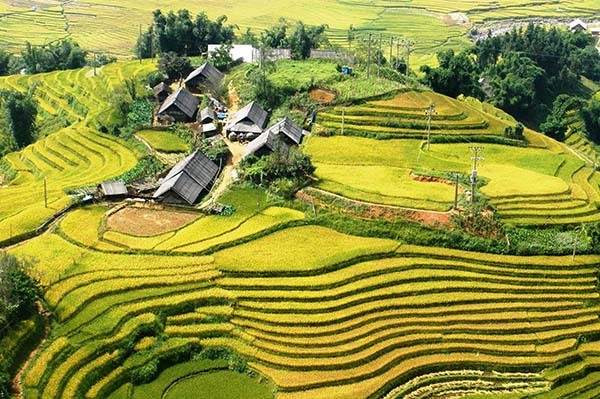 You can explore the life of ethnic minorities; admire the spectacular natural scenery with the terraced rice fields. You visit Sapa’s ancient rock with engraved images, both big and small – unique patterns of the ancients. Approaching the life of H’mong local people, you can know how they make their clothing. They buy the yarn at a local market; they still typically weave and embroider the fabric themselves. Their many crafts, their embroidery is stunning. The other villages in Sapa hiking trails are Lao Chai and Ta Van village. You have a chance to get the spectacular mountain scenery and walk through traditional villages and their surrounding rice paddies. Firstly, you come to Lao Chai which is a village of Black Hmong ethnic people. 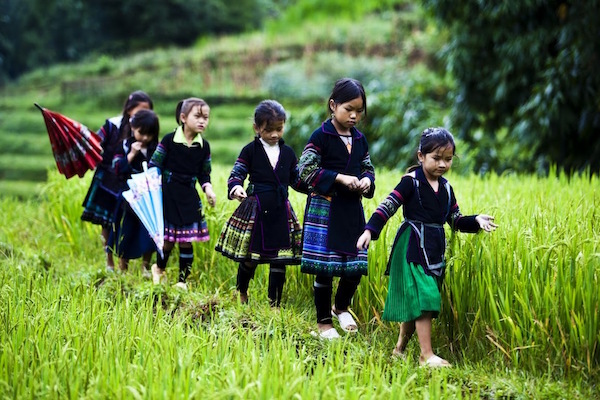 Coming here, you will be caught up their daily life and how to make their traditional clothes, handicraft, indigo… Moreover, you have a chance to visit the biggest valley which offers to you the best views of the golden rice terrace field in Vietnam. After the Lao Chai village, you walk to Ta Van, a village of Giay people. It is a small group of ethnic people living in Vietnam, they still preserve a rich and traditional culture. Of course, you will enjoy the lunch with a local family in one of the beautiful traditional houses located on their rice paddy fields. After that, you can have a short sleep in the local people. 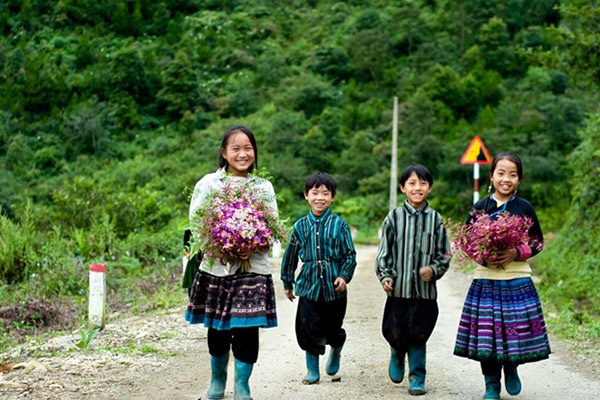 Hiking through Muong Hoa Valley, you can catch up other tribal villages such as Ta Van Village and Ho Village. Muong Hoa valley is blooming with lots of colorful flowers in a wide range of various beauties. It is the time that the rice terraces are full of water at which you can contemplate one of the best scenery like the reflection of the sunshine on the fields’ surface. Silver fall is located about a half hour from Sapa town that offers stunning views over surrounding mountains and lush forests belonging to Hoang Lien National Park. After taking a rest nearby a waterfall to refresh, you will start climbing uphill to a road, the car and your driver are ready for your journey back to Sapa. Ham Rong botanical garden is the mainstream place for many foreigners, which is located not very far from center of Sapa town. Ham Rong is one of the most attractive places owning many types of flowers and orchard gardens. Stones appear on the path, which lead tourists to wild peach forest, then orchid gardens with more than 6000 orchid plants belonging to 194 kinds. There are a lot of indigenous flowers grown along the paths such as Lily of the Nile, hydrangea, geraniums, ox-eyed daisy and cheery blossom. In there, you will find some fruits like peach, plum, and pear are also found here. The scenery was hidden in the fog and echo sound from bamboo flute of Mong minority boy change this place into a heaven on the earth. 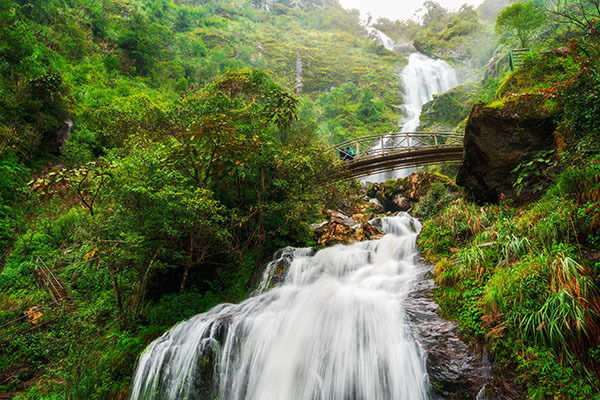 From Sapa town, you go to the west about 12 kilometers on the road to Lai Chau, you will meet Silver waterfalls rushing flowing down from 200 meters creating the futuristic sound of the jungle. Crossing Silver Waterfall, you catch up Love Waterfall. The name of this waterfall originates from a legendary love story that has been told to generations in this land. Long time ago, this waterfall was the bathing place from heaven. In history, a fairy was mesmerized by flute sound of a young boy near the fall, so she listened to his melodies. Her parents know the secret, and they forbid her coming back to the fall. Her passion is transformed herself to a bird in order to live with her love forever. From then on, the name Love is born. If you stand a far, Love Waterfall looks like a sparkling stream of light. Tram Ton is called the Sky Gate, it is located between the majestic Hoang Lien Son. And portal is the apex of this pass. Standing in the port of heaven, you can take a panoramic view with the green rice fields, the roads, and the Silver Falls. You have an opportunity to feel the glorious and charming beauty of Sapa. We believe that the above information will help you know the Sapa hiking trails. If you have any questions, let’s send for us to deal. 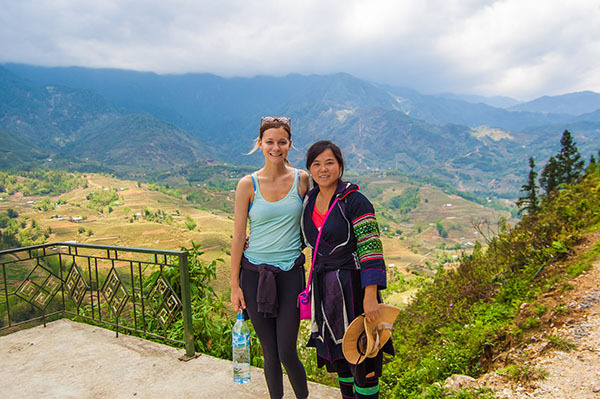 HOW TO MAKE YOU WONDERFUL DURING SAPA HIKING TOURS?